Tonight we hand you over to our good friend and technological expert The Tame Geek, who has been behind the wheel of another new car! Another review of a car that’s not from the VW Group?! YES! The Tame Geek has been busy! Busy and loving it. As regular readers will know, I have a soft spot for coupés. I love the way they look, the way they drive and the way they make you feel. So after getting offered a drive in a brand new type of coupé, I couldn’t turn it down. There have been big shifts in BMW over the last few years. After loosing their way a bit and releasing abominations like the X6, it was clear that a change was needed. First up was an all new 3 Series. The car that has been the leader in the C/D segment since it was invented, was important. Audi, Mercedes and VW had been chipping away at sales and had been closing the gap between them and the top dog. The new 3 Series blew them all back. Faster, more economical and with more kit, it quickly re-established its dominance. There’s only one thing it didn’t have. A coupé. Audi never released an A4 coupé; they released the A5. They never released an A3 coupé; they brought us the TT. 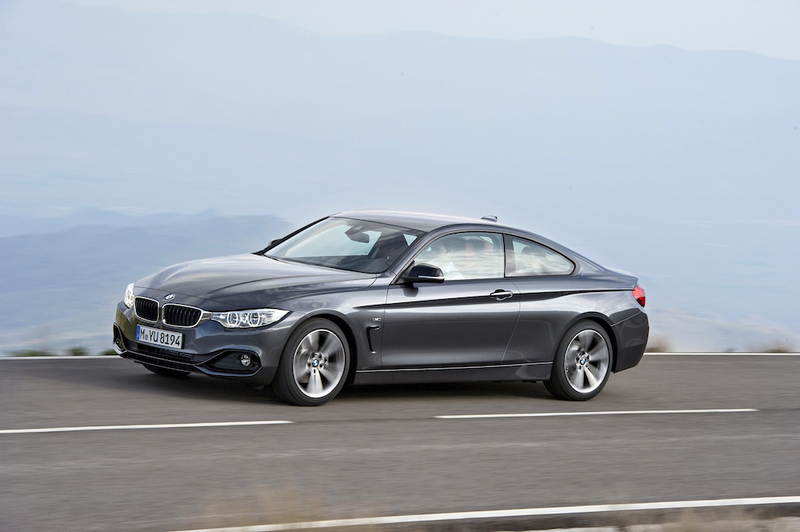 Following this model, BMW have decided to keep the coupés in their range as dedicated cars. Interestingly, they will all be even numbers. The 1 Series gives us the 2 Series. Then the new 4 Series and the 6 Series. You could even consider the RE EV i8 in this group. 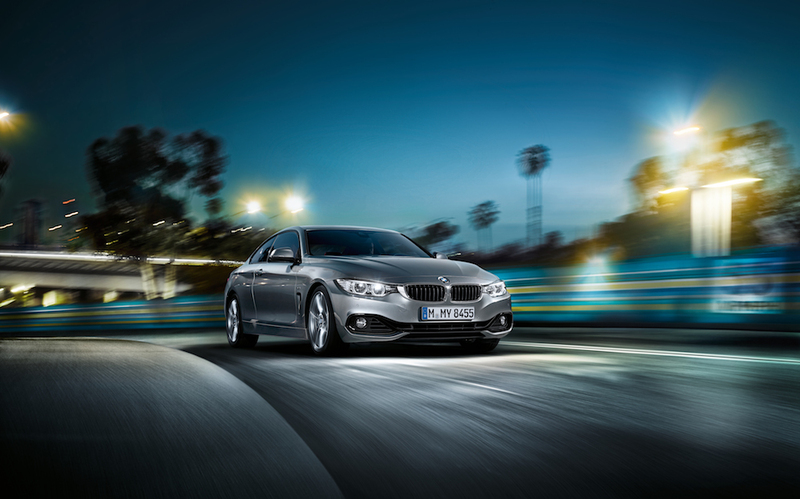 With the background considered and the keys in hand, let’s talk about the new 3 Series coupé, the 4 Series. The styling of the 4 mirrors the 3 but has a far more muscular stance. The sloping roof line and the widened arches give the 4 a look of a European muscle car. It has presence. I can only imagine at this point what the M version’s body kit will do to enhance that, but let it be said that in this guise, other motorists soon vacated the outside lane for the 4 to make its way through. It was almost like the BMW had regained the ‘Move! Peasant!’ air that they badge once had. 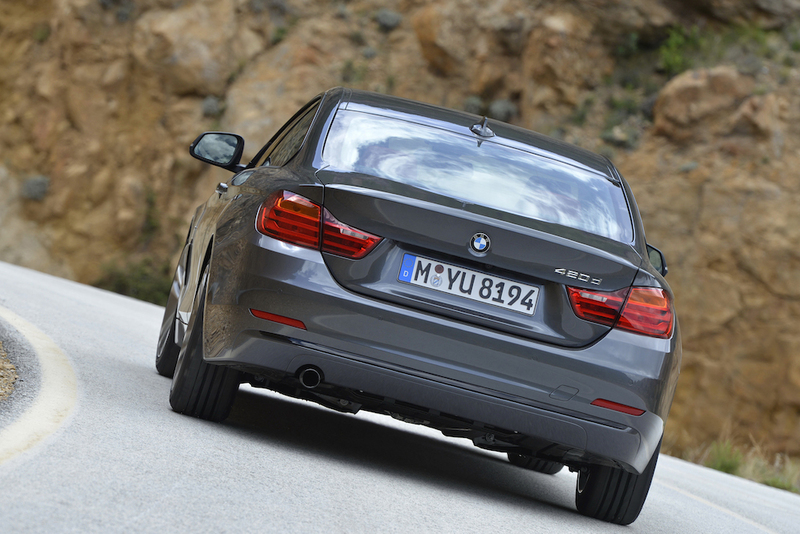 Getting in to the 4 is a joy as the large, frame-less doors seem a tad smaller than the outgoing 3 series coupé. A bit more manageable and it was easy for a passenger to slink in to the back seat. The inside of the 4 is, how’s best to put it, ‘driver focused’. That lower roof-line, black leather and dash mixed with a dark head-liner made for a cocooned environment. It’s not like the 3 series, where you have more visible space, it does the coupé ‘thing’; It reminds you you’re here to drive. The rest of the interior is stylish and clean. As you would expect from a premium product. The infotainment screen is large and arguably, a little to large for the environment it’s in. There will come a point in the near future where screens in cars will become a bit to big and need to scale back down again. An example of this is the new Mercedes S-Class, with its twin TVs on the dash. The interior is festooned with buttons, presented in a logical order and given how much of a drivers car this is, many of them will be pressed and tinkered with. I, of course, refer to the obligatory sport mode engaging buttons. I really wish I has spent more time fiddling with the buttons before we got under way. Changing driving mode on the road is easily done but that nice big screen gives you an intricate 3D model from Tron showing the changes to the drivetrain and the engine. The suspension setting also glows. It looks great but is nothing more than distraction on the entrance to a roundabout. This 420d came with something the standard cars don’t. The 8 speed auto gearbox. The drive selector in the BMW doesn’t have the same definite feel and motion of the Audi auto boxes. It’s more of a joy stick in the BMW. This can be forgiven considering how much less you’ll be touching it when driving. You’ll only every really want to use the paddles. Talking about the gearbox is a good place to start about how it is to drive. This is a 2 Litre, 4 cylinder turbo diesel. It shouldn’t be as fun and satisfying as it is. I’m a bit of an aficionado of engines in this configuration. Their power, torque and economy often make them the most sensible engines available today, so for one to surprise me was a delight. The BMW TwinPower Turbo unit delivers 184 BHP, 380 Nm of torque and 62 Mph in 7.3 second with the 8 speed gearbox and will take you all the way to 144 Mph. Still think diesel is for trucks and tractors? BMW say it’s good for 60 miles per gallon and with regular driving, you could easily score in the mid 50’s. There’s always a bit of a power void low down with turbo diesel engines. The TwinPower negates this quite well, especially with the 8 gear ratios to play with. Hitting the loud pedal from near standing on a slip road, I was rocked up to motorway speed, up the slip road and joined the traffic with no concern. If I needed power, it was there. Cursing along, the 4 is comfortable and has been tuned well for the UK’s scared roads. Running on stock wheels, not some monstrous 19″ things with paint rather than rubber on the rims, I should add. A bad choice of wheels and the run flat tyres could ruin your days. As we meandered along, I checked in with my passenger in the back, who was comfy and completely oblivious to the fact that we could be doing ludicrous speeds and they wouldn’t have known. Getting the idea that the 4 is more than accomplished for the day-to-day drive, it was time to show it some bends. This was done in two ways. In Normal mode and in Sport mode. In Normal mode the 4 is as pliant and comfortable as any German cruiser. A little natural role to keep the car comfortable and compliant. In Sport mode though, things change. After I remembered to watch the road and not the screen, I immediately noticed how the steering on the 4 was more direct. Hugely more, this isn’t to say that it’s vague in Normal mode, it’s just that in Sport mode, the car’s nose goes directly where you want it and remains there till you pick a new target apex. It was a bit damp on our drive out and that 380 Nm of torque made it’s self noticed as we went round a roundabout after pulling the trigger down on the gearbox a few. Sideways, in diesel. Yes, the black pump can power slide. Straighten back up and given a bit of thrash on the way back before settling in to regular driving made one thing quite clear. This could be all the car you’d ever want. 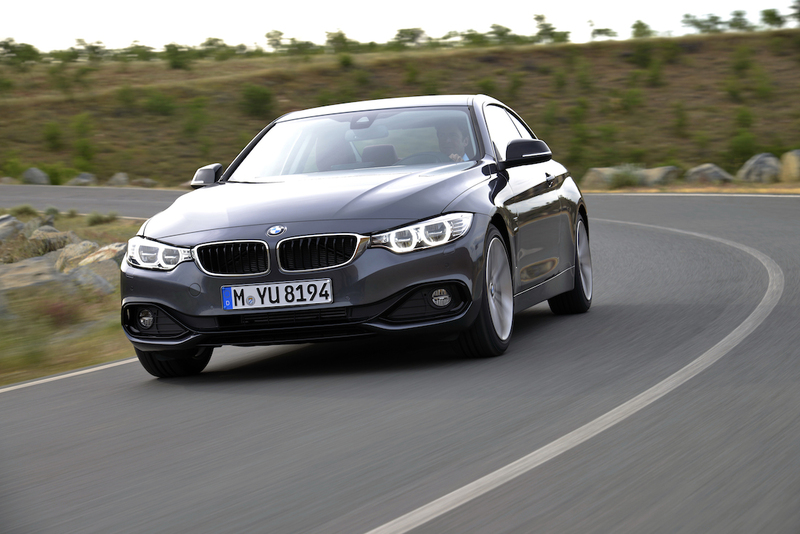 The BMW 420d is smooth, refined, as fast as you could ever use on the road safely and economical. I struggle to think of things to go against it for an enthusiastic driver. Yes, it’s a diesel, but if you, do over 20,000 miles a year, it becomes a sensible option. There’s only one real draw back. If you you’re a company car kind of person, you’ll be all too aware that many companies don’t like coupés. Well, good news! It would appear, that BMW are worried about the popularity of the A5 Sportback and are bringing their own 4 door coupé to market. So it leaves it to be said that, yes, the Tame Geek can recommend a car that isn’t from the VAG family. In fact, it may be his next personal choice. As ever, don’t forget to check out The Tame Geek for all your technology info.